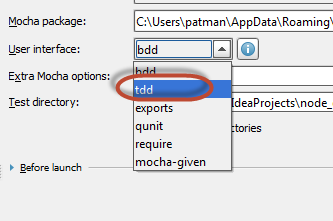 I also set up mocha with chai for my TDD testing see http://www.whiteboardcoder.com/2015/04/intellij-and-nodejs-setting-up-tdd.html . I want to go through setting up a simple RESTful API that returns a simple JSON object. 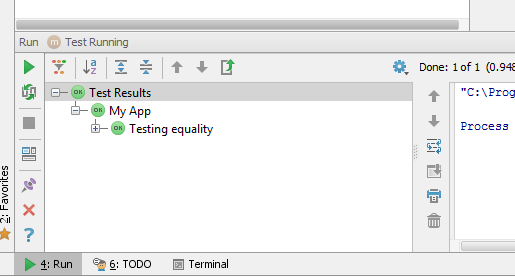 I want to develop this all via TDD (Test Driven Development). Before I dive in I want to give a few good references I used to help me out http://webapplog.com/tdd/  and https://vimeo.com/105382485  In fact go watch the vimeo video it's well done. 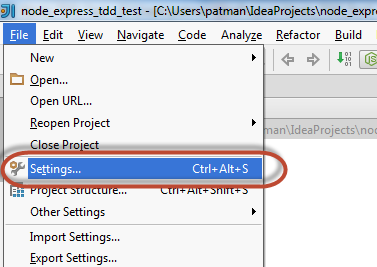 I will be doing this in Intellij. 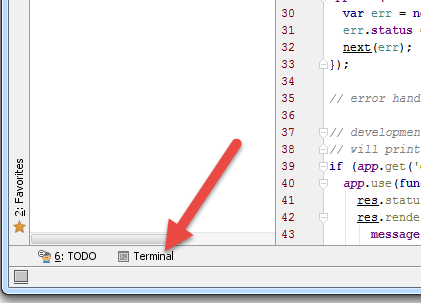 You don't need Intellij, I just wanted to capture how to do it in Intellij for my own future reference. 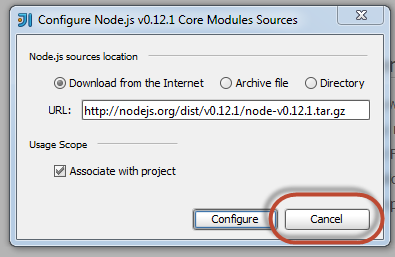 I am going to assume you have Node installed and you have the NodePlugin installed for Intellij. 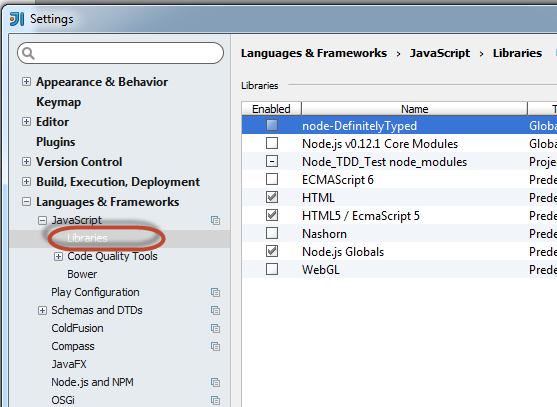 Select Node.js and NPM and click Next. Give it a name and click Finish. This pops up. (for me). 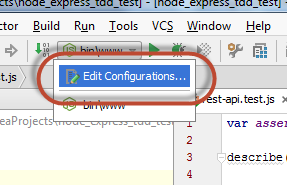 This is supposed to configure the Intellij so that it can have Code Completion on the Base NodeJS libraries. I can't seem to set it up right. So I click cancel (and set it up manually). 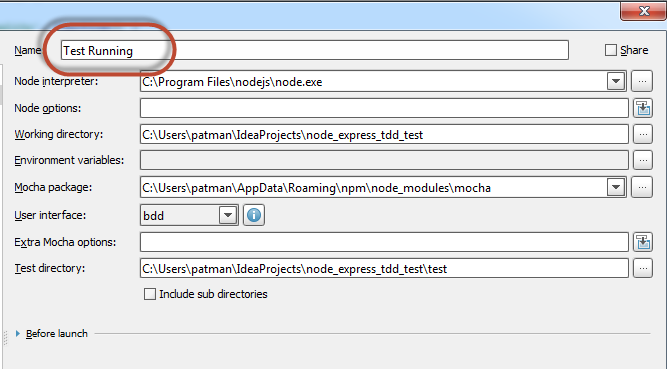 To set up code completion for Node base libraries do the following. 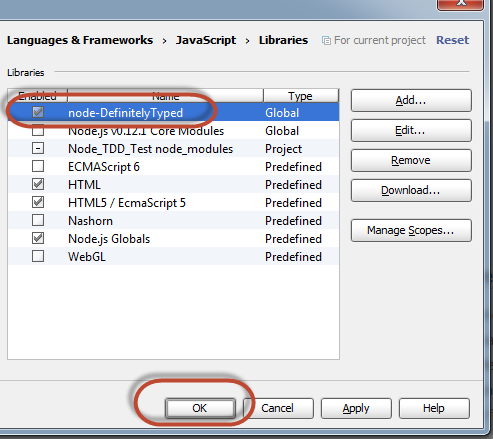 Checkbox nod-DefinitelyTyped and click OK. 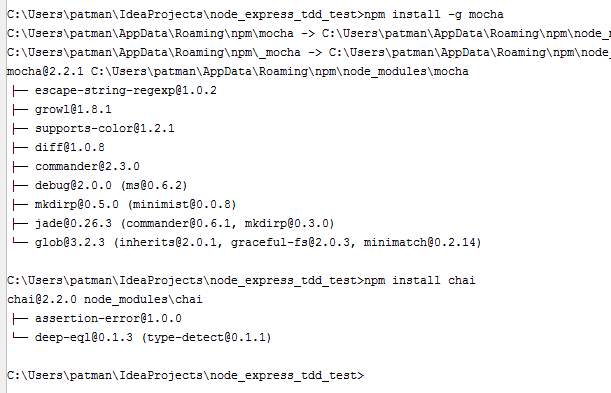 Install mocha and chai via the npm command line tool. 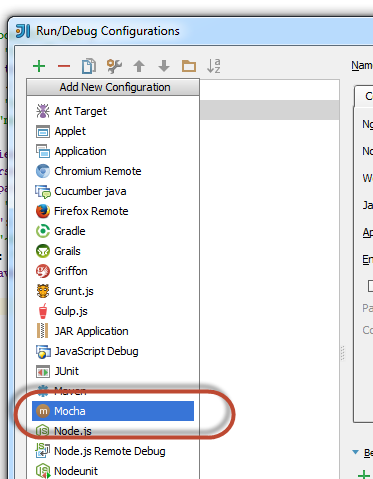 Run the following commands to install the mocha and chai modules. 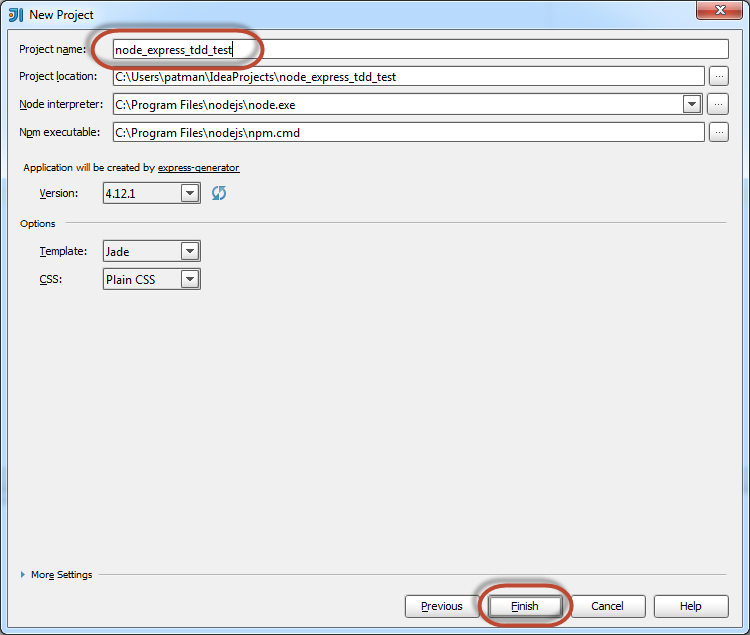 Right click on the project and select New -> Directory. 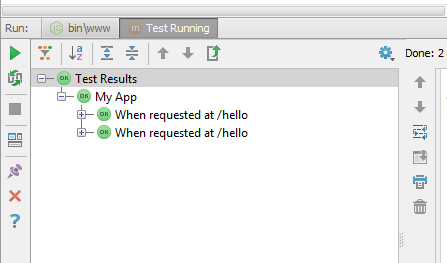 Create a rest-api.test.js file in the tests folder. 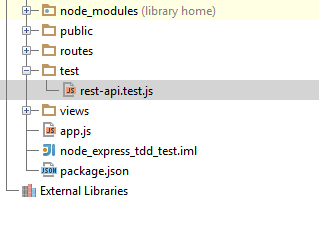 You can edit the package.json file to add a script to run the tests. Here is how I edited my file. Now I can run this from the command line to run the script. 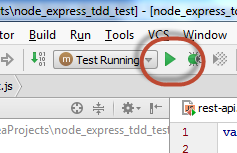 Click on Edit Configurations on the top. Make sure the mocha package is correct. That ran. 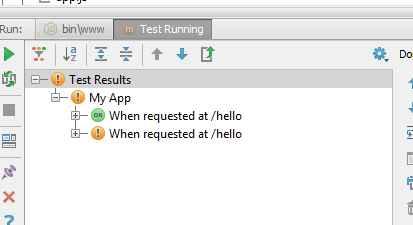 OK now the testing is set up and working… now onto writing the actual test. Install superagent, I will be using it for testing. What is the first feature I want? /hello should return 200 status. 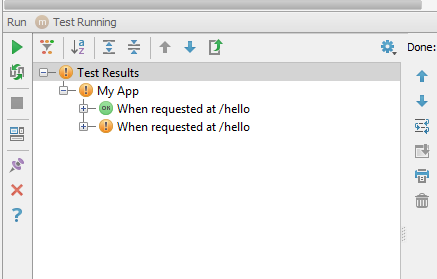 Since this is an asynchronous call you have to use done() as a callback to finish the test when the async is complete. As Expected a failure occurred. 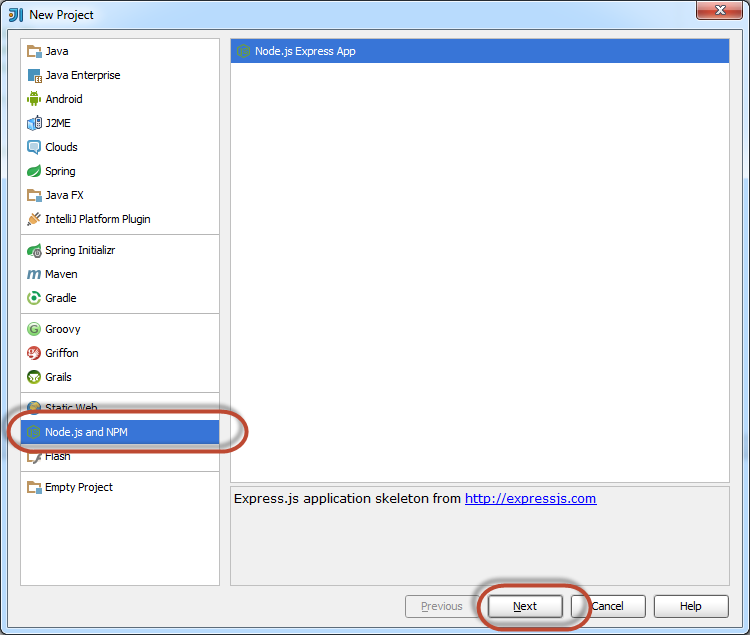 The default created app.js is a little too complex for starting something very simple. 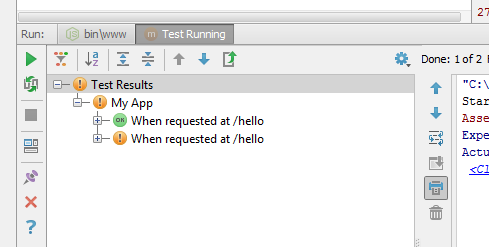 Update app.js to the following. 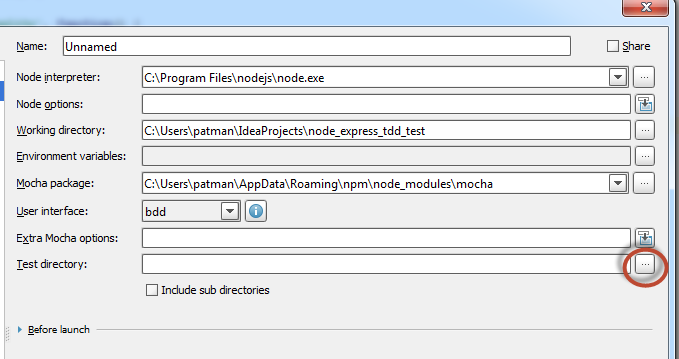 Also update the bin/www file (the script Intellij is using to run the program. Or alternatively you can run them from the command line. 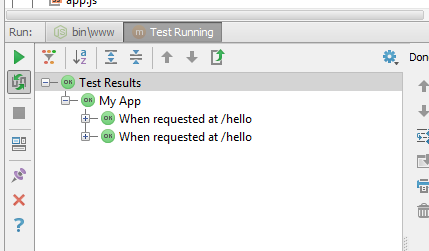 · The JSON has an object named "msg"
· The String begins with "Hello"
Add a new test, check for content-type = "application/json"
It fails, because we are not sending json yet. Rather than using assert.equal I can use assert.include. I Updated the test again. 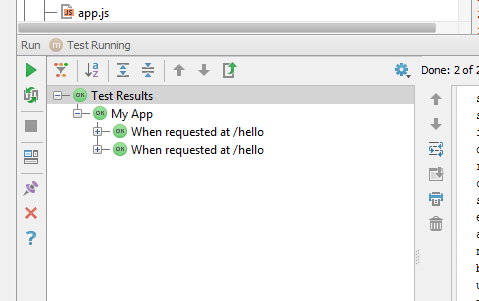 Now it will check if the content-type contains application/json. 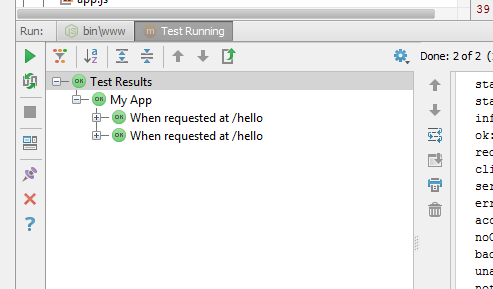 But it's not done yet that test also needs to confirm that it has an object named "msg" and that object is a String. 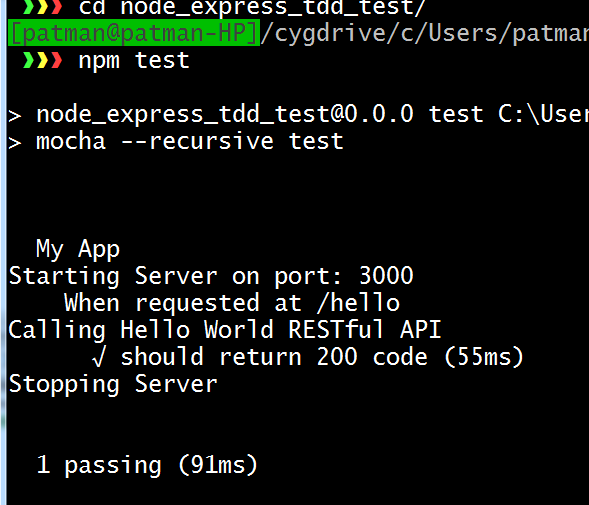 How do you test JSON in chai? I found this resource http://chaijs.com/plugins/chai-json-schema a chai plugin to test against JSON. I got a dependency error. 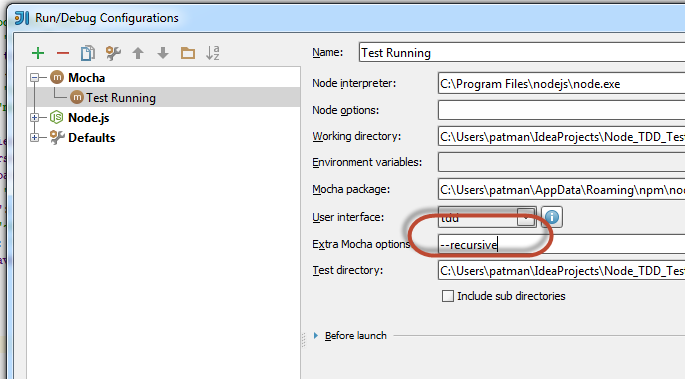 "peerinvalid The package chai does not satisfy its siblings' peerDependencies requirements! " "chai": ">= 1.6.1 < 2"
Looks like there have not been any updates in while. Hooray for forking open source projects on github. 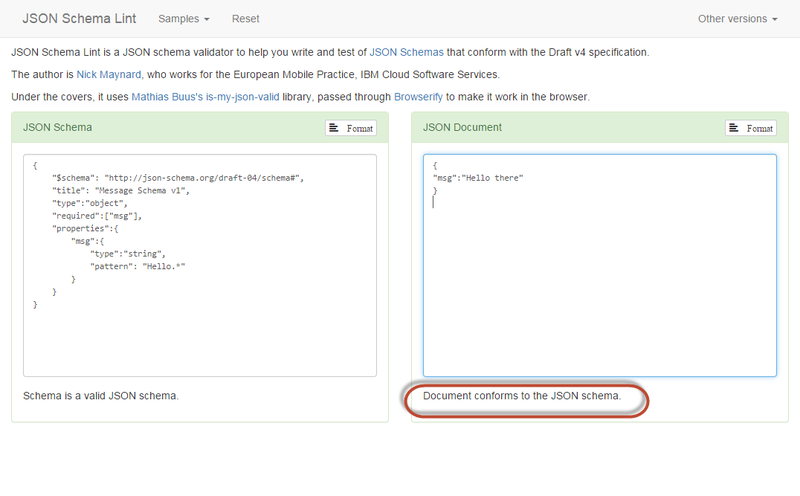 JSON does not have a schema set up like XML. In the past I have had used XML schemas, but I have yet to set up a JSON schema. If you are unfamiliar with schemas here is the short… short version. A schema defines your data format, what is allowed, and how the data is formatted. 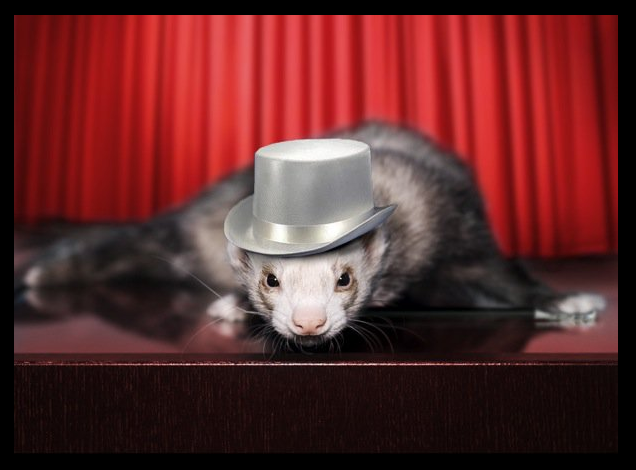 JSON does not have a formal schema format, the JSON standard is straight, simple, and to the point. Schema's can be heavy handed, but sometimes you just need them. 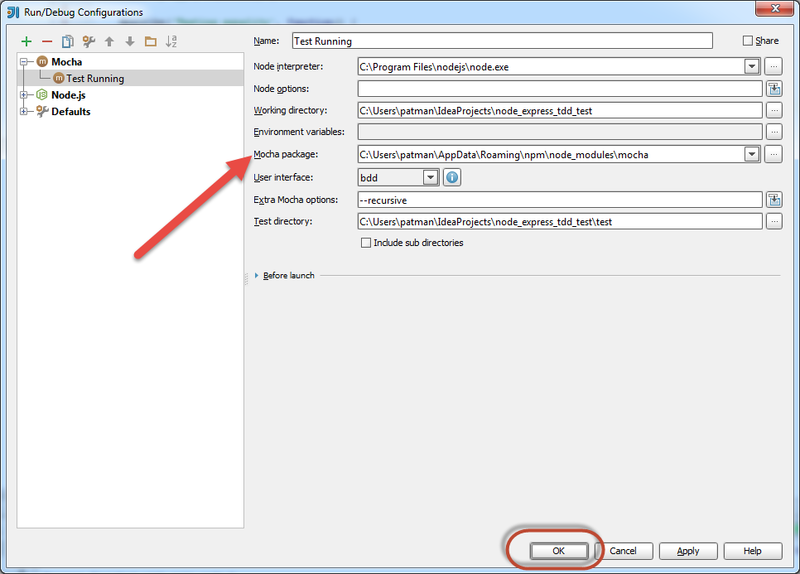 Create the schema to test against the JSON. It looks good. Now add it to the test. Here is my updated test code. The JSON I am sending is purposely bad and fails the schema test. 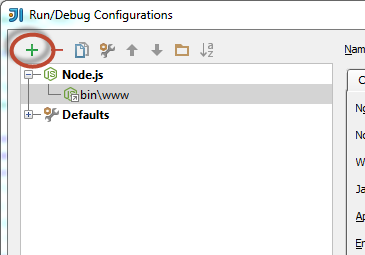 I did not remove the "invalid" JSON object I just added a new one. It fails again. This time it sees the msg object, but it also sees the message object is a number and not a string. It fails again. 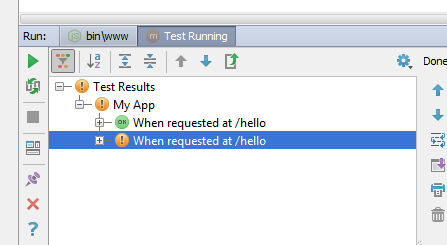 It fails because I am testing the string against a regular expression. The String must begin with "Hello"
Turns out I did not define my Regex expression correctly. It will accept messages that contain "Hello" rather than start with Hello. It will pass all tests. The pattern does not match.